Jim Eade, U.S. 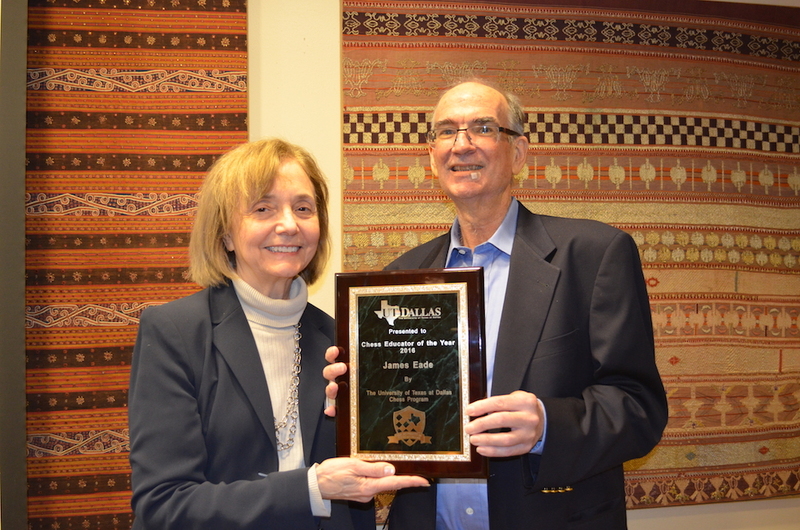 Chess Trust president and author of one of the best-selling chess books in history, Chess for Dummies, was honored as Chess Educator of the Year by the University of Texas-Dallas at a well-attended ceremony on February 24 on campus at UT-Dallas Eugene McDermott Library. Among other accomplishments, Eade is a chess master, a best-selling chess author, editor and book publisher. He’s a past president of the Chess Journalists of America. He is also an important chess patron who sponsored high-level events that gave US players an opportunity to achieve results qualifying them for international titles. When Jim was a young teenager, Bobby Fischer’s successful run to the world championship in the early 1970s inspired him, as it motivated so many others, to become involved with chess. By 1981, Eade had earned the National Master title for his over-the-board play in tournaments. He also played chess by mail, earning the title of “Postal Master” in 1984. He continued to climb the title ladder, accumulating 300 games as a master to claim the US Chess Federation’s elite Life Master certification. He went on to gain the FIDE Master title from the World Chess Federation. Jim is still ranked highly in the very top percentile of tournament chess players. 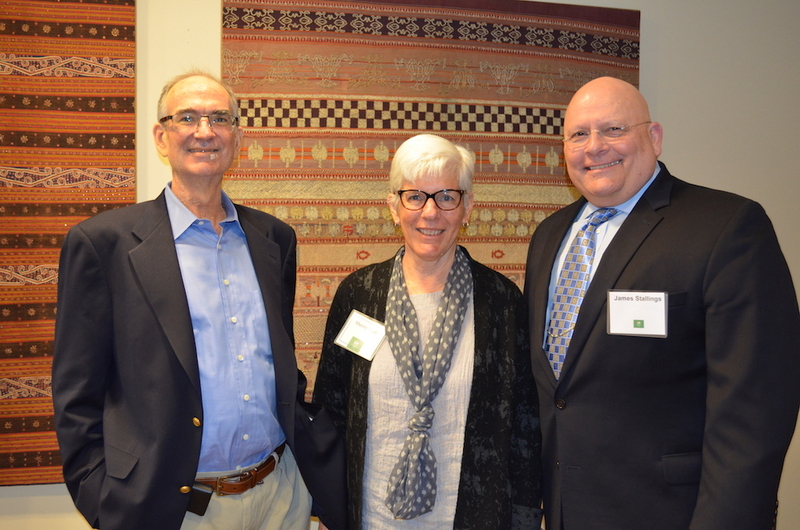 Jim Eade, wife Sheri Anderson, and UT-Dallas Chess Program Director James Stallings at the event. James Stallings, director of UT-Dallas’ national championship program, emceed the Chess Educator of the Year ceremony. 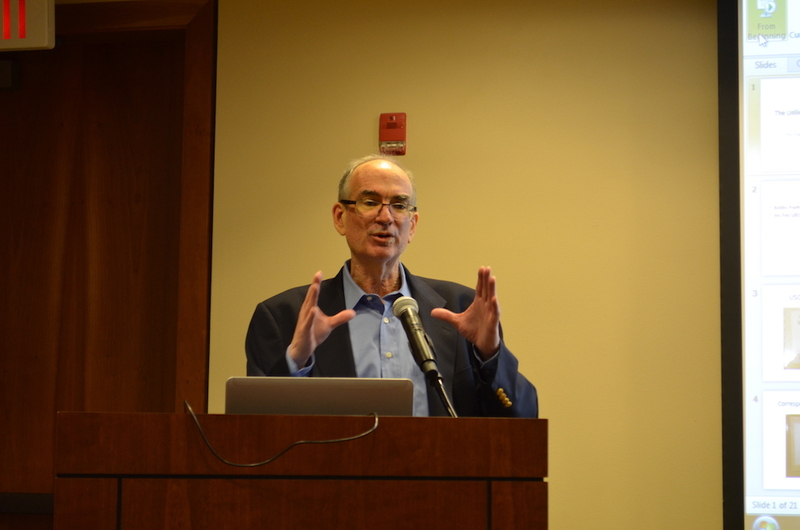 Eade is a former chairman of the University’s chess advisory board. Dr. Ellen Safely, Dean of the UT-Dallas Libraries, introduced Eade, who spoke about his love of chess and the process of giving back in various ways. As he recounted his experiences, Eade covered the gamut of chess—learning, playing, teaching, and writing. Eade’s efforts are hardly over. One of his newest priorities, even as he works on a fourth edition of Chess for Dummies, is forging a national effort to bring chess to seniors. UT-Dallas Associate Provost Dr. Abby Kratz presents Jim Eade with the Educator of the Year award. Associate Provost Dr. Abby Kratz, who leads the Office of Institutional Scholarship Administration, closed the ceremony by presenting Eade’s plaque. “If an award could mean more to me than this one, I don’t know what it would be,” Eade said. On the second day of the two-day “ChessFest” celebrating Eade’s award at Eugene McDermott Library, GMs Denis Kadric and David Berczes took on all comers in a series of blindfold games.